The Vector CRB Submachine Gun has a slower fire rate than most submachine guns but more accuracy and higher damage. This, combined with the high mobility, makes it well suited for medium range engagements. It is still effective at short and long range, but will be at a disadvantage to other weapons specialized for those ranges. The Vector CRB is a versatile weapon. You don’t need to focus on specific range engagements, but should prefer the medium range. The very long range, where snipers dominate, can also be a severe problem. The vector CRB lets you focus on getting to objectives as quickly as possible. You can rely on the strong performance of the weapon at most ranges to ensure you can successfully complete any objective. The attachments I found most useful were those that increased the long range performance where the default Vector CRB is a little lacking. The Foregrip will help with your accuracy by decreasing the recoil of the Vector CRB. The Muzzle Brake increases the damage at long range. If you find that you have trouble with aiming at long range replace the Foregrip with your favorite sight since the Vector CRB doesn’t have strong recoil anyway. In the selection of the perks focus on those that let you move around the map easier. Slight of Hand combined with On the Go will let you complete reloads faster reducing the downtime between magazines. Blind Eye keeps you safe from air support, Sentries and Oracle Systems so that you can focus on objectives under all circumstances. Resilience negates fall damage making it easier to move. ICU reduces the health regeneration time letting you take on enemies in quicker succession. In summary the vector CRB is a versatile weapon that is very good at completing objectives. The Foregrip, Muzzle Brake and perk selection increases the versatility of the Vector CRB ensuring objectives are as easy as possible to complete. 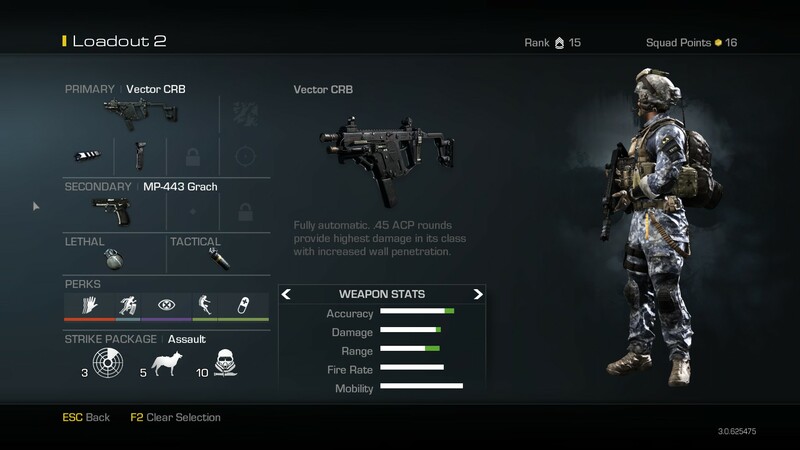 This entry was posted in CoD Ghosts Weapon Guide, Submachine Guns and tagged auluftwaffles, best Class Setup, Best Soldier Setup, Call of Duty, Call of Duty Ghosts, Call of Duty Ghosts Weapon Guide, Games, gaming, Ghosts, Ghosts Weapon Guide, guide, PC, Ps3, PS4, Vector CRB, Vector CRB Best Class Setup, Vector CRB Best Soldier Setup, Vector CRB Guide, Vector CRB Weapon Guide, video game guides, Video Games, Weapon Guide, XBOX 360, XBOX ONE. Bookmark the permalink. The vector doesn’t need a fore grip; I usually do well with armor piercing and make sure you’ve got scavenger because more often than not you’ll probably run out of ammo before you die.